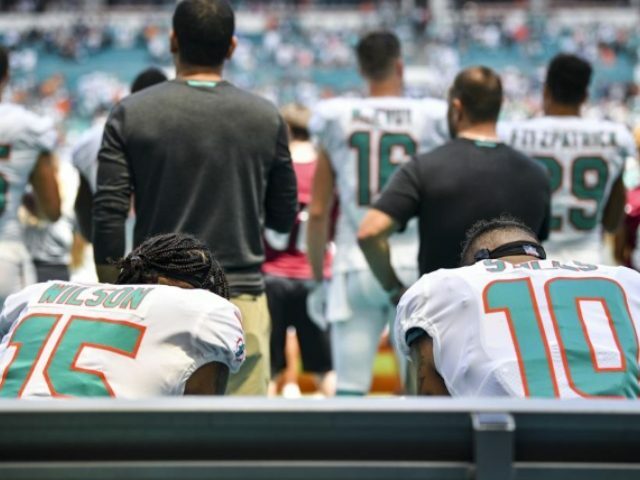 Miami Dolphins receivers Kenny Stills and Albert Wilson kneeled during "The Star-Spangled Banner" and defensive end Robert Quinn raised a fist during the song ahead of the team's season opener against visiting Tennessee. Colin Kaepernick has tweeted to thank the Miami Dolphins players that kneeled before the National Football League anthem this weekend. Stills told the New York Times earlier this week that he planned to continue carrying Colin Kaepernick's torch, even though "the first two years of this protest have been really hard with the negative backlash we've been receiving". Kaepernick sparked controversy when he sat, then knelt, during the National Anthem before several 2016 NFL preseason and regular-season games. He also said he will not stand for the anthem until Kaepernick and Eric Reid, who protested with Kaepernick, are back. Kaepernick said in a Twitter post accompanied by a picture of the two players kneeling. Before the late games, Broncos receiver Demaryius Thomas and linebacker Brandon Marshall, and Seahawks linemen Duane Brown and Quinton Jefferson, retreated to their respective tunnels while the anthem played. "I think there's a huge need for us to turn the attention towards the issues and not only the issues, but what players actually do in their communities to effectuate change". "Were trying to move past the rhetoric of whats right or whats wrong in terms of the anthem, and really focus on the systematic issues that are plaguing our communities".